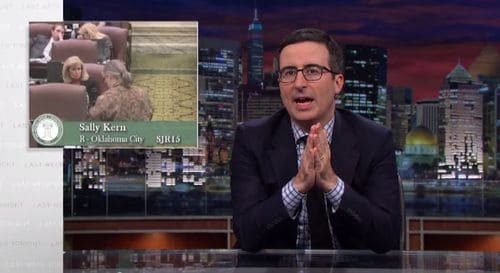 With our current Congress on track to be the least productive in history and the Senate likely to remain inactive regardless of which party wins on Tuesday, John Oliver decided to focus on some of the important (and bizarre) midterm campaigns taking place on the state level. One incumbent legislator put under Oliver's magnifying glass? None other than Oklahoma lawmaker Sally "gays are worse than terrorists" Kern. When state legislators across the nation introduce similar or identical bills designed to boost corporate power and profits, reduce workers rights, limit corporate accountability for pollution, or restrict voting, odds are good that the legislation was not written by a state lawmaker but by corporate lobbyists working through the American Legislative Exchange Council. ALEC is a one-stop shop for corporations looking to identify friendly state legislators and work with them to get special-interest legislation introduced. It’s a win-win for corporations, their lobbyists, and right-wing legislators. But the big losers are citizens whose rights and interests are sold off to the highest bidder.